Gabbro ( /ˈɡæbroʊ/) refers to a large group of dark, coarse-grained, intrusive mafic igneous rocks chemically equivalent to basalt. The rocks are plutonic, formed when molten magma is trapped beneath the Earth's surface and cools into a crystalline mass. Gabbro as a xenolith in a granite, easternSierra Nevada, Rock Creek Canyon, California. Gabbro is dense, greenish or dark-colored and contains pyroxene, plagioclase, amphibole, and olivine (olivine gabbro when olivine is present in a large amount). The pyroxene is mostly clinopyroxene; small amounts of orthopyroxene may be present. If the amount of orthopyroxene is substantially greater than the amount of clinopyroxene, the rock is then a norite. Quartz gabbros are also known to occur and are probably derived from magma that was over-saturated with silica. Essexites represent gabbros whose parent magma was under-saturated with silica, resulting in the formation of the feldspathoid mineral nepheline. (Silica saturation of a rock can be evaluated by normative mineralogy). Gabbros contain minor amounts, typically a few percent, of iron-titanium oxides such as magnetite, ilmenite, and ulvospinel. Gabbro is generally coarse grained, with crystals in the size range of 1 mm or greater. 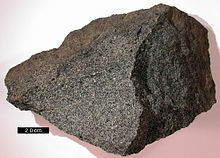 Finer grained equivalents of gabbro are calleddiabase, although the vernacular term microgabbro is often used when extra descriptiveness is desired. Gabbro may be extremely coarse grained to pegmatitic, and some pyroxene-plagioclase cumulates are essentially coarse grained gabbro, although these may exhibit acicular crystal habits.